March 23, 2011: I'd spent seven years at the New York Post before leaving in 2010 to launch Racked National (now just default Racked.com) at the Curbed Network (now a part of Vox) but I was still close with Posties Andy Wang real estate editor and David Landsel travel editor, so we were making plans to meet up. Andy's friend Phiderika had told him about these epic-stealth flash mob dinners that had been happening every Friday night in the basement of a neighborhood Chinese restaurant, Legend on 15th and 7th, and I think we'd been meaning to check it out. 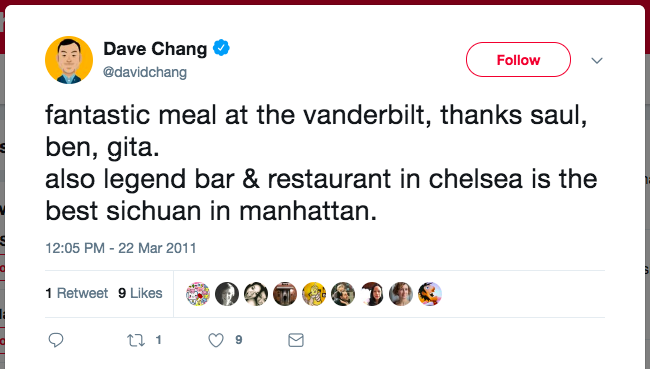 I think, to be honest, Sichuan food wasn't as much of a thing in New York at the time, so we were compelled to go immediately mostly because of Dave Chang's tweet and FOMO. That, and I'd just been to a good Sichuan restaurant in Flushing with my parents the weekend before and, you know how it is, once you get a whiff of mala nothing else hits the spot in the quite the same way, especially in the tail-end of a New York City winter. Seven years on, this first dinner at Legend feels like forever ago. 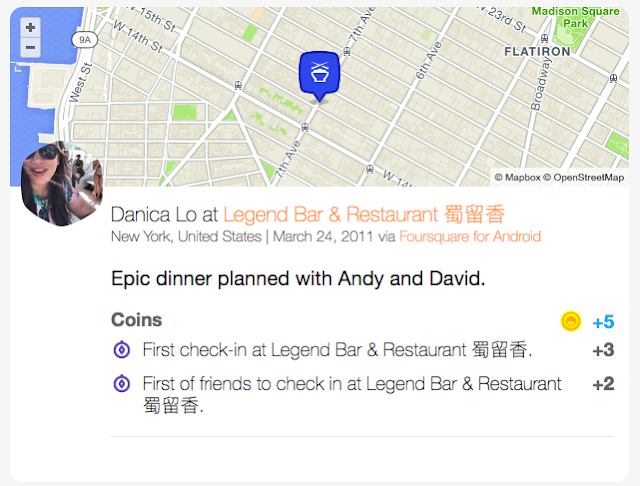 Look at that Foursquare checkin! First of all, Foursquare. Second: I was using an Android! I think it was a Verizon Motorola something with a sliding screen. I think I'd gotten it for free. A few weeks later, after an email debrief from Andy's friend Phiderika on the unspoken rules of Legend's Friday night dinner, we braved the Friday night dinner. I can't find the email in my Gmail, but it was in listicle format and went something like this: Don't say anything to anybody, walk straight downstairs, sit at any table, don't come with more than four people, there's a section reserved for hotpot, at 7 p.m. sharp the chef or staff will come out to take orders, if you don't know what's going on just let the people at your table order, they'll bring out lots of dishes to share, bring cash to split the bill, it'll be about $25 a head. Sometime that spring, we started calling it Chinese Food Fight Club. Mostly because of all the rules. I also liked that people would come on their own—white collar first-generation Chinese drifters in search of a great, super-spicy meal shared with strangers, everyone after the same thing. It felt very pure. By June, David had decamped to Detroit and Andy and I had launched full-on Legend evangelism by organizing informal group dinners where he'd invite a gang of real estate people and I'd invite a gang of fashion people and we'd all cram in around one round table downstairs. 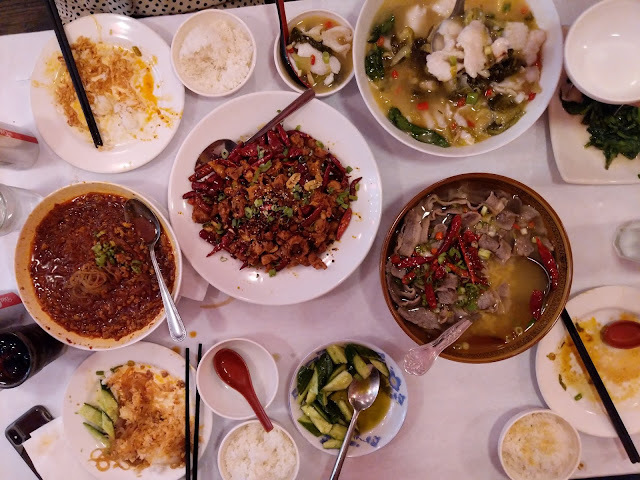 We called it Chinese Food Fight Club to entice our jaded media friends and colleagues and it was an easy way to one, hang out with people we liked, and two, maximize our meals, so we could order and try as many dishes as possible in one weeknight sitting. In retrospect, with the social media boom just over the horizon and our mid-to-late-30s creeping up on us, it was also the last irl social networking moment I can remember—before the late-Gen X westward migration and the all the babies everyone wound up having just a couple of years down the line. These days we all still talk, but mostly just through screens, tapping on handheld devices with our thumbs. 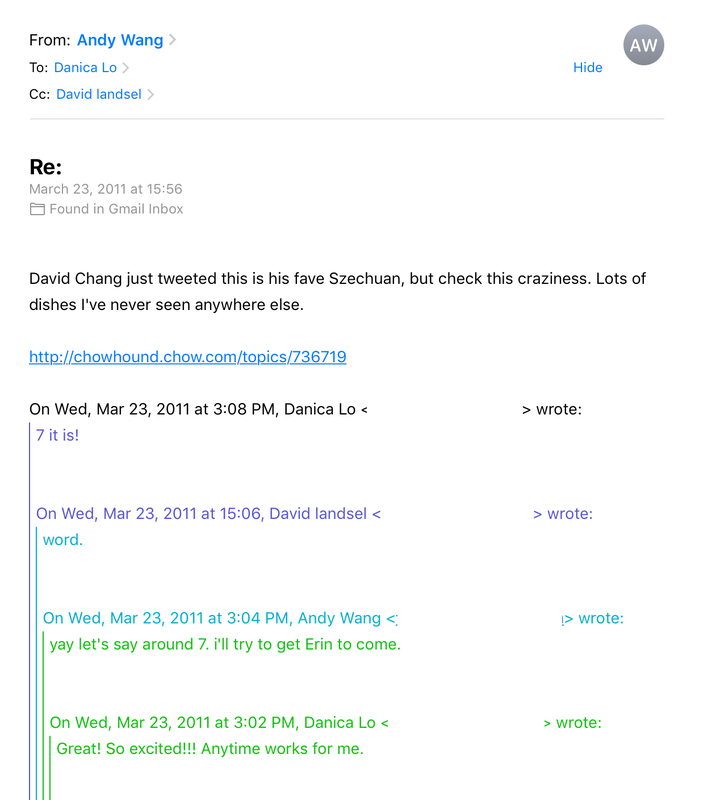 I just now searched my Gmail inbox and it looks like between June 2011 and December 2016, I used the phrase "Chinese Food Fight Club" 127 times. That's a lot of people and a lot of dinners—and it's not even counting "Legend" emails, text messages, or work emails. Then in July, this happened. "To the mystification of the city’s Sichuan food cultists, they continued serving summer rolls and shu mai, all the while putting out word in the Chinese community about the Sichuan cuisine being cooked by the chef Ding Gen Wang, a master who cooked most recently at Grand Sichuan Eastern in Midtown," wrote the Times' Julia Moskin. "Despite the confusion and a vast menu still larded with distractions, the aromatic, spicy Sichuan food actually cooked by Chef Wang here is often unbelievably good." For the next few months, getting into Legend was pretty difficult, so Chinese Food Fight Club went on hiatus and we all just did our own thing. 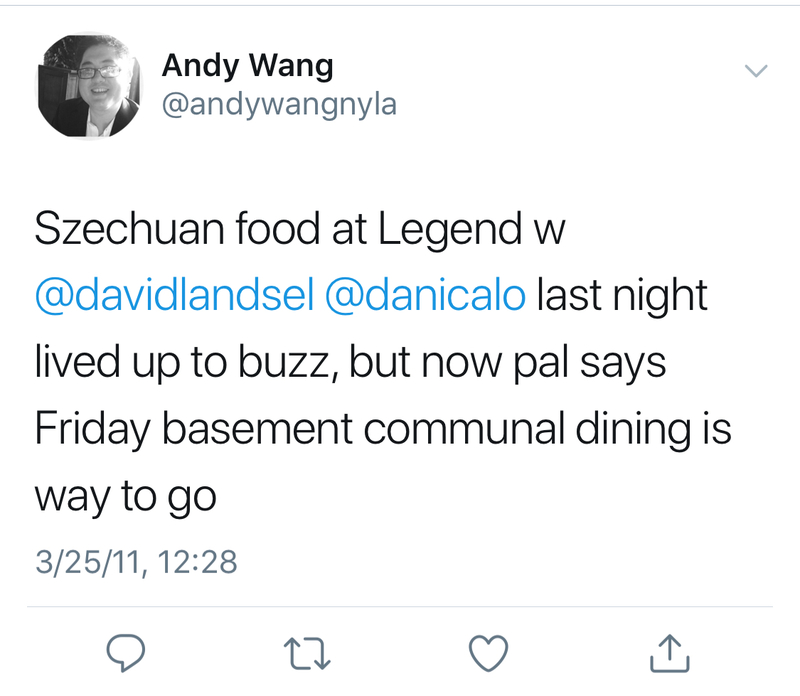 Big group dinners became fewer and farther between, but Andy, David, Alex, and I would still make it to Legend regularly—for friends-only pre-dinners, post-event debriefs, life catch-ups, or when someone we knew and respected had never been. 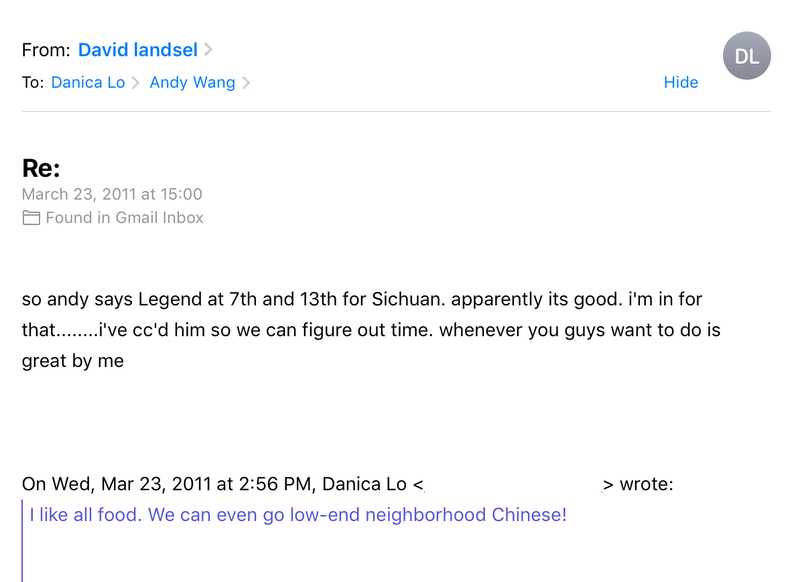 We were always trying to take peoples' Legend virginity, and we always told them about Chinese Food Fight Club—as if it had been a long-running dinner series and not just one great season of Sichuan. Legend closed in July 2018. Despite reports to the contrary, the closure is permanent, and there's another restaurant slated to open in its place. 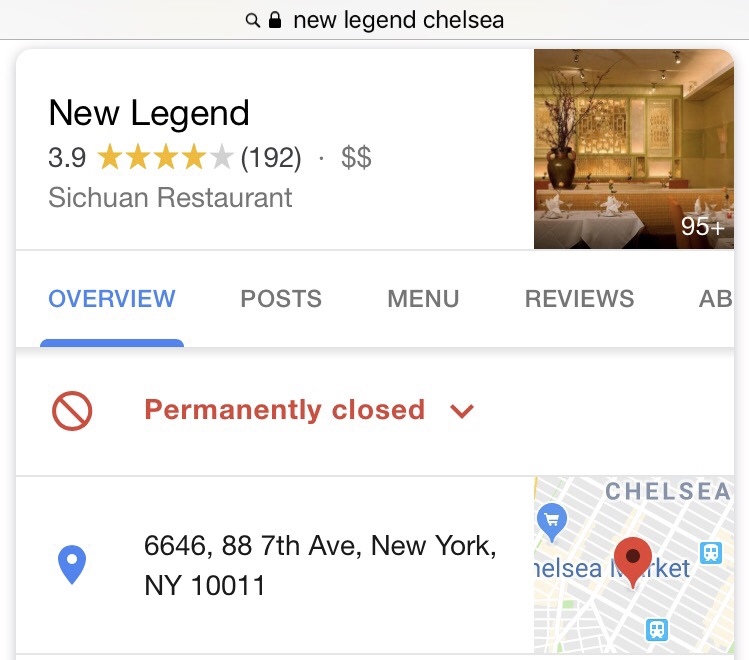 The OG chef left in 2015 (he opened a new restaurant in New Hyde Park), and "New Legend" opened a couple of branches further uptown (the one on the UWS appears to still be open). Andy, David, Alex, and I have been group-texting about the closing all day—I'm the only one of us four who still lives in New York, but I think we all feel this deeply. Over the years, Andy and I brought some big deal people (before they were big deals) to eat fish soup with us in the basement of Legend, but we also brought people we loved who were visiting from out-of-town, because Legend was our spot. Andy would pre-game and post-game much fancier dinners at Legend; for me, it was my go-to order on Seamless, sometimes twice a week. Every time any of these guys come back to New York, we meet at Legend. The last time we were there was June 29—Andy was in from LA and we took Maria, the restaurant editor from my digital team at Food & Wine, for lunch, and it was better than it's ever been. "I was just telling a food writer pal that I've learned one thing over the years," David texted us this morning. "And that is to not wait to celebrate and spend time with restaurants that you love, while they are here or while they are good, because they mostly go away and leave you behind." It's funny how much things can change in seven years. But at the end of the day, Legend was a great neighborhood Chinese restaurant that had an epic run, better than most.